Kindle is a very popular ereader or tablet choice among kids, especially Kindle Fire. There is a reason for this. It has a lot more features, content and accessories for kids than regular tablet devices. In this article, we will be looking at the best kindle accessories for kids that make a Kindle tablet more suitable and fun for children. First let’s look at the first accessory that comes to mind: covers. As we can guess, it is a must for a Kindle that is used by a kid. That kind of Kindle covers should protect the Kindle device from bouncing, and dropping. That’s why there are tough cases for kids. The most popular example for kindle covers for kids is the i-Blason ArmorBox Kido Series for Amazon Kindle Fire and you get to select which type of 2012 or 2013 Kindle Fire HD, HDX you need to keep protected. If you want to protect your Kindle Fire against dust, sand, rain, wind, drops, and vibration, Travellor covers are great alternatives to them with lots of color combinations. I think, the best Kindle Fire cover for a girl is eForCity Pink/ White Polka Dot PU Folio Leather Case With Stand. On the other hand, boys favorite is BLUE iPearl mCover Leather Cover Case for 7″ Amazon Kindle Fire Tablet. 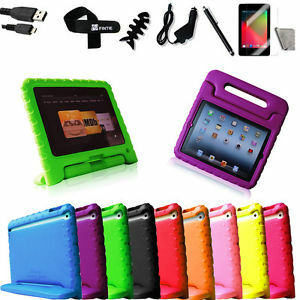 Colorful leather covers are also very good gift ideas for kids. Sometimes you just don’t need to hear what your child is doing on the Kindle Fire! The JLab JBuddies Kids volume limiting headphones are a popular choice for children with a Kindle Fire. These headphones are designed for kids from age 2+ and are adjustable to fit. Kindle Fire Speakers and the Marware UpSurge Rechargeable Mini Speaker are also popular accessories. The iKross speakers stack together with a handy magnetic lock. They are rechargeable so you don’t need to worry about batteries or an electrical socket. Marware speaker is a single mini-speaker and it’s available in a range of bright kid-friendly colors. A stylus can give greater accuracy for little kids. It’s also good for practicing pencil grip when they are learning to write. GreatShield Chalkee Kid Friendly Stylus for Touchscreen Devices is big and chunky – great for little hands. You can do lots on a Kindle Fire without needing a keyboard, but there are times when it’s handy. Typing is a useful skill for kids to learn and a tablet sized keyboard is actually better suited to kids little hands than a full-size one. The Poetic KeyBook Bluetooth Keyboard Case is available in colorful purple and red. And it gets good reviews too. Watching videos on long car journeys is a popular use for the Kindle Fire HD. It’s safer and more convenient to fix the tablet to the headrest of the front seat rather than the child having to hold the device and it gives a better viewing position. You can try TFY Car Headrest Mount Holder for Kindle Fire HD 7 for this purpose.